Commissioned by The Other Art Fair, a November 2011 poll of 1,000 British painters and sculptors declared him Britain's most influential artist of all time. 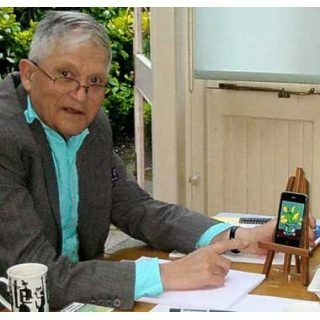 David Hockney is born in Bradford, Yorkshire, on 9 July, the son of Kenneth and Laura Hockney. Between 1953-57 he studied at Bradford School of Art, where his fellow students include Norman Stevens, David Oxtoby and John Loker. He received a traditional training based on drawing from life and produces figure studies, portraits and cityscapes. In 1959 he began his studies at the Royal College of Art, London, where he met R.B. Kitaj, Derek Boshier, Allen Jones, Peter Phillips and Patrick Caulfield. His tutors included Roger de Grey, Ceri Richards, Ruskin Spear and Carel Weight. By 1962 he exhibits four Demonstrations of Versatility at the Young Contemporaries. Through this he became friends with designer Ossie Clark. He then visited Florence, Rome and Berlin with Jeff Goodman. He also graduated from the Royal College of Art with a gold medal. Moves into Powis Terrace in the Notting Hill district of London. By 1965 David has moved to America and accepted a teaching position at the University of Colorado, Boulder. At the end of the term he drives back to Los Angeles with Patrick Procktor, Colin Self and Norman Stevens, visiting the old Colorado gold mines, San Francisco and Disneyland on the way. While in Los Angeles, he works on A Hollywood Collection, a series of six colour lithographs for Ken Tyler at the Gemini workshop. He meets Bobby Earle, who joins him and Procktor on the drive to New York and return boat trip to London. In 1970 Hockney had his first retrospective, David Hockney: Paintings, Prints and Drawings 1960–1970, opens at the Whitechapel Art Gallery in London. Throughout the year Hockney made various trips to Europe and visits New York and Los Angeles. He paints Le Parc des Sources, Vichy, a portrait of Peter Schlesinger and Ossie Clark with surrealist overtones, which deals with illusionistic space. Begins Mr and Mrs Clark and Percy, the painting that comes closest to naturalism according to Hockney. Commissioned to paint a portrait of Sir David Webster for the Royal Opera House, London. 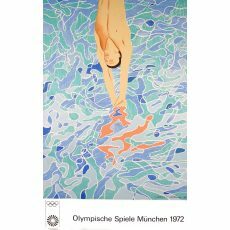 In 1967, Hockney's painting, Peter Getting Out Of Nick's Pool, won the John Moores Painting Prize at the Walker Art Gallery in Liverpool. Hockney was offered a knighthood in 1990 but declined, before accepting an Order of Merit in January 2012. He was awarded The Royal Photographic Society's Progress medal in 1988 and the Special 150th Anniversary Medal and Honorary Fellowship (HonFRPS) in recognition of a sustained, significant constribution to the art of photography in 2003. He was made a Companion of Honour in 1997 and is a Royal Academican. In 2012, Queen Elizabeth II appointed him to the Order of Merit, an honor restricted to 24 members at any one tiem for their contributions to the arts and sciences. He was a Distinguished Honoree of the National Arts Association, Los Angeles, in 1991 and received the First Annual Award of Achievement from the Archives of American Arts, Los Angeles, in 1993. He was appointed to the Board of Trustees of the American Associates of the Royal Academy Trust, New York in 1992 and was given a Foreign Honorary Membership to the American Academy of Arts and Sciences, Cambridge, Massachusetts in 1997. In 2003, Hockney was awarded the Lorenzo de' Medici Lifetime Career Award of the Florence Biennale, Italy.